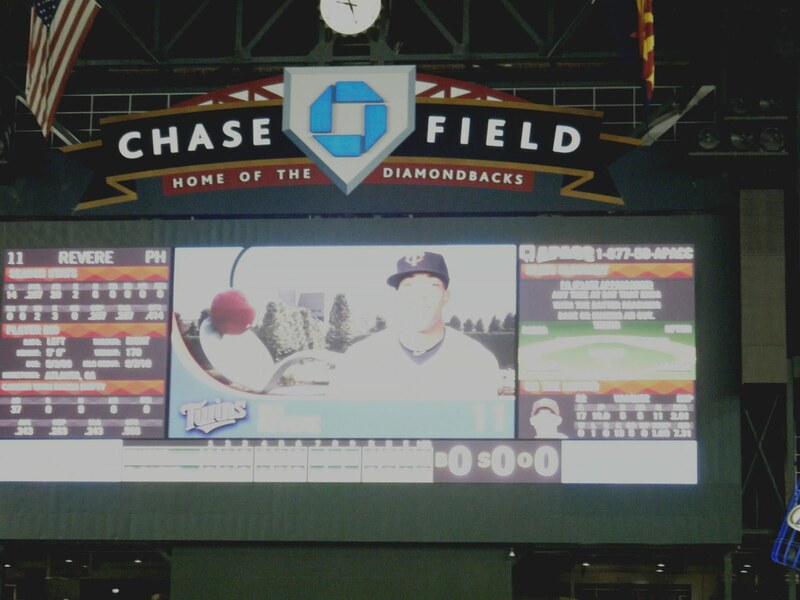 I never got to watch Harmon Killebrew play. As a Minnesotan child of the ‘80s, I watched a different hero. But I have always been aware of who Harmon Killebrew was, and what he did, because Harmon was my Mom’s hero, and my Mom is the reason I love baseball. She has told me her stories many times. Growing up as the youngest of ten children on a dairy farm in northern Minnesota, my Mom and her older brother would listen to games on the radio and act them out in the yard. Her brother—the second youngest, but still seven years older than her—always got to be Harmon Killebrew. “I had to be Bob Allison,” Mom always says. In 2006, the Twins won the AL Central on the last day of the season, giving them home field advantage against the A’s in the first round of the playoffs. At one of the games, my Mom saw Harmon sitting in the stands a few sections away. Fans didn’t recognize him. My Mom—in her Harmon Killebrew throwback jersey—approached him after the game. “Harmon, you have always been my hero,” she said. She told him her story about acting out the games as a girl. Of course, Harmon replied, “Bob Allison was a great player to be.” And even though he doesn’t usually sign jerseys, he signed her jersey. My Mom wore that jersey to the Twins game last Friday, and when she turned her back and they put her on the jumbotron at the end of the game, everybody cheered. 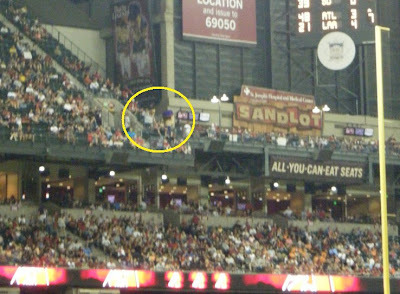 My Mom didn’t even realize she was on the jumbotron. I had to explain to her that’s why everyone was just cheering. Of course, the secret is, my Mom, as a girl, also used to pretend to play baseball in the yard by herself, when her brothers were not around. And then, she got to be Harmon Killebrew. I had the pleasure of meeting Harmon Killebrew while attending a charity banquet for the Harmon Killebrew Foundation several years ago. It is a great charity, and I urge fans to give something in Harmon’s honor, if you can. 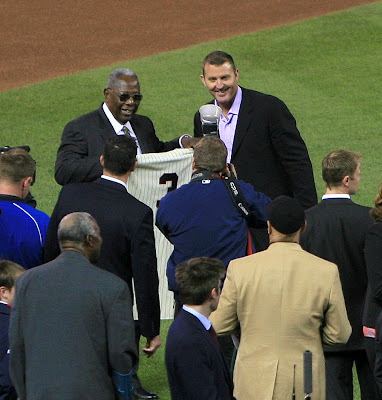 It would be the type of thing Harmon would do—and we would all be better people if we tried to be even just a little more like Harmon Killebrew. Thank you, Harmon, for playing the game, and more importantly, being such a wonderful person. Yeah, okay, God hates the Twins. We get it. 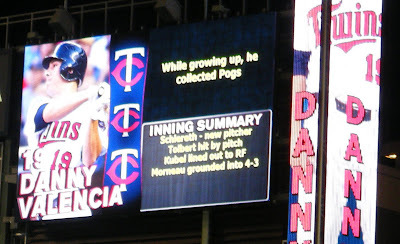 For a second during tonight’s game, though, it looked like God might be on the Twins side. Detroit had already piled on 5 runs by the fourth inning, but the sky had suddenly become very ominous. It took on a greenish tint, and the temperature dropped. Rain drops started to fall. I prayed, prayed to god, that it would start pouring before it reached the 5th inning and this became a game. Sure enough, in the bottom of the 4th, there were a few flashes of lightening, and second base umpire Jerry Lane started walking in. Target Field’s second ever rain delay! My Mom immediately bolted up to the Metropolitan Club (where she later reported more bars were added over the off-season, and so “it’s a lot easier to get drinks”… and I definitely believed her), but I stayed behind to see what everyone decided to do during the rain delay. 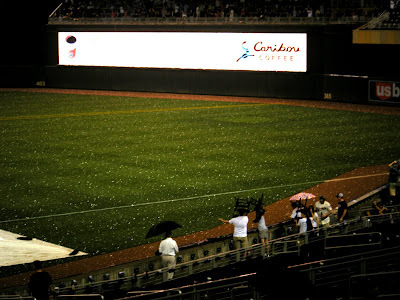 And then a fan decided to run onto the field at the height of the hail storm, which was, sadly, the best part of the entire game. It was looking pretty good for the Twins… except then it ‘miraculously’ stopped hailing, stopped raining, and the sunset started to come out again. The field was a total mess—the equivalent of being covered with marbles and golf balls. So obviously that had to be cleaned up, which it was (#$%#%) by a very hard working grounds crew with super awesome tractor-blower things, rakes, shovels, and buckets. By the time the game got back underway I was still waiting for my Parmesan-garlic fries inside of Hrbek’s, where everyone was infinitely more interested in the Red Wings-Sharks game. 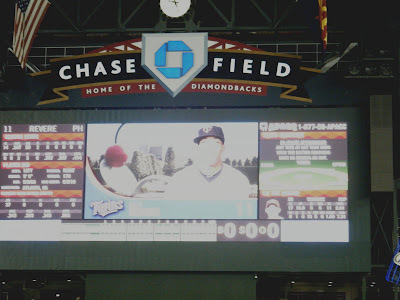 In fact, I think there was a mini-riot when workers tried to change the TVs back to the Twins game. I was impressed with how many fans actually stayed through the rain delay, but as the game wore on, and it got late, the vast majority of them left—which I actually liked even more. By the end of the game all of the nay-sayers, Debbie-downers, and ‘I don’t really watch baseball I’m just rich and this is the place to be seen’ people were gone. The fans who were there were the ones who were still enjoying themselves. 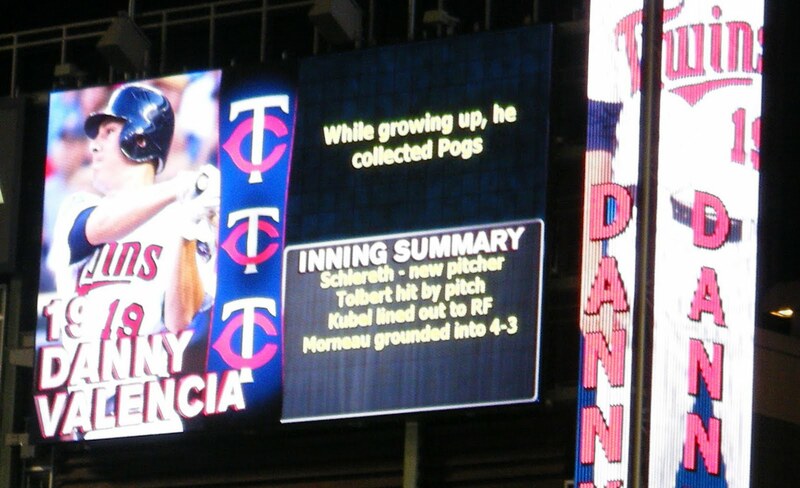 They were the ones who weren't going to let rain, hail, or even the 2011 god-damn Twins ruin their night. I could even hear the enjoyable hecklers come out again, the type I haven’t been able to hear since the Metrodome. On the way home, I said to my Mom, “You know, that was a horrible game... but I had a lot of fun tonight.” She agreed. So hopefully that can be the silver lining—finding a way to use the game as an excuse for having a good time. Like that kid who ran on the field in the height of the hail storm, because that was awesome.